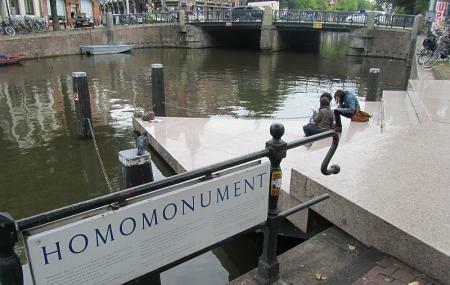 Homomonument is a memorial in the center of the city of Amsterdam. The monument of Homomonument is to commemorate all the people of the gay and lesbian community that were persecuted because of their sexuality. The monument stands as a reminder of what happened in the past so visiting the structure becomes a must. Take out some time and pay the place a visit and feel a glimpse of the past through it. People normally club together Sugarfactory and De Gooyer Windmill while planning their visit to Homomonument. I was expecting something more visually attractive, as this small monument is easy to pass by without giving it a moment of thought, one of the most important ends of any monument. The idea of having a monument to let people know how difficult it has been and it sometimes is to enjoy your human rights when your sexual preference or identity is other than the one you are suppossed to have is great, but I think it was poorly executed. Many cities around the world could follow Amsterdam's lead and create their own homomonuments to make locals and tourists aware of the rights earned by the LBGTI community, and the abuses they still have to face. Lovely place to take a quiet moment and remember. Like the history it commemorates, this quietly elegant and understated monument is easy to overlook. That would be a mistake.